Thou shall be more regular with the blog! I usually keep repeating this to myself but never get around to clearing the drafts in my folder. Nonetheless here I am, if you are someone who enjoys a good breakfast then read on. It’s one of the most blissful feelings waking up early on weekday and fixing yourself a good hearty meal just when life takes over. An empty stomach growling on a busy work day in the middle of a business meeting is never a good call. I’m not much of a morning person but having a steaming hot cup of masala chai followed by breakfast definitely helps me begin the day beautifully. It’s actually an indulgence for some but for me it’s a necessity. I never ever skip a breakfast. I usually like savory in my breakfast so most mornings consist a sandwich, toasted brown bread layered with peanut butter or labneh and topped up with tomatoes, carrots, cucumber and some crumbled feta or cheese. Other days I like a hearty poha or upma but it’s a task to make them and means dedicating 20 minutes in the morning for this. 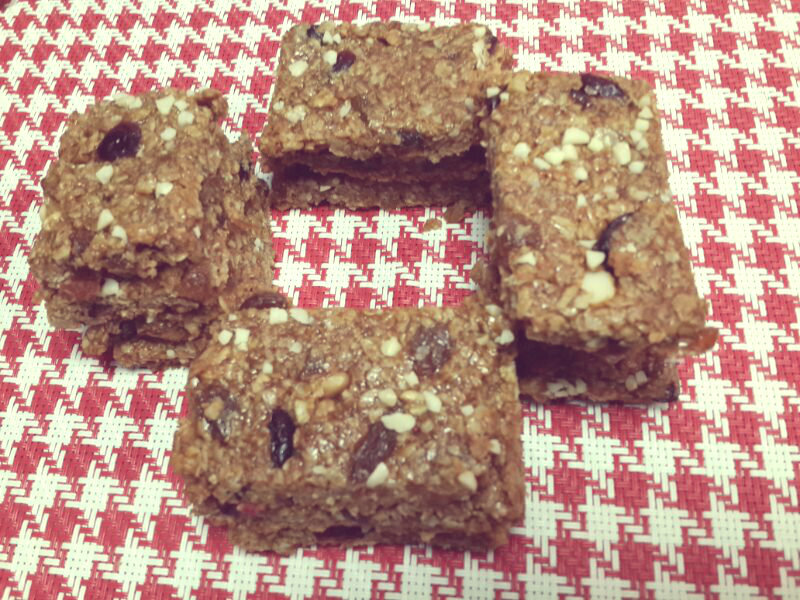 Then there was a phase where all I would want to eat was granola bars so I loaded the pantry with some oats and honey crunchy granola bars. After spending a fortune on store bought artificially sweetened and calorie heavy variety, I decided to bake some at home. 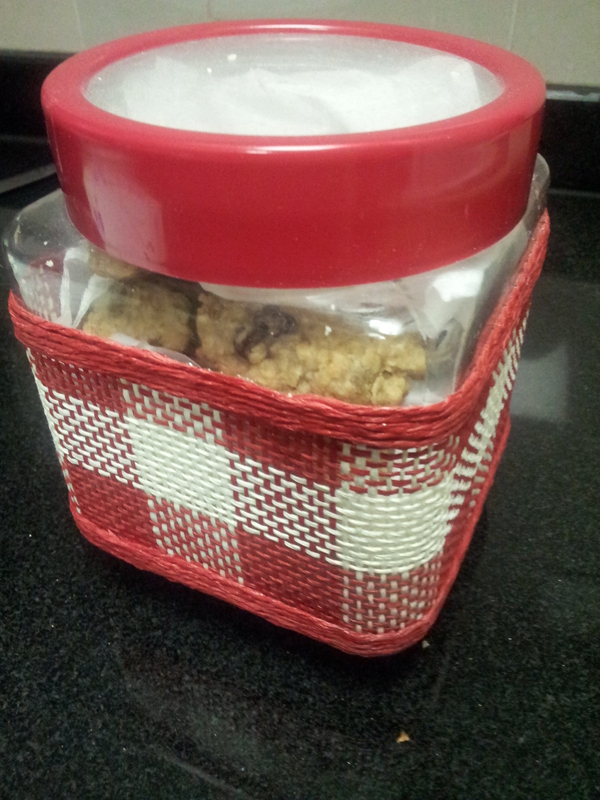 I baked some chewy granola bars fews weeks back and some more over the last fortnight for Mum-in-law to take them home. 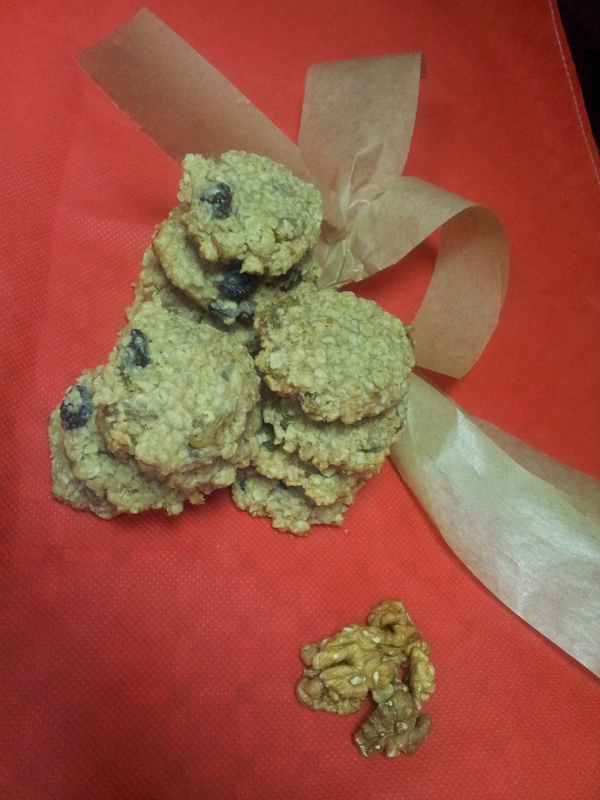 I personally love them to be crunchy however since mum-in-law was in town, I decided to make them chewy so that she can eat them easily. Pre-heat oven at 175 degrees Celcius. 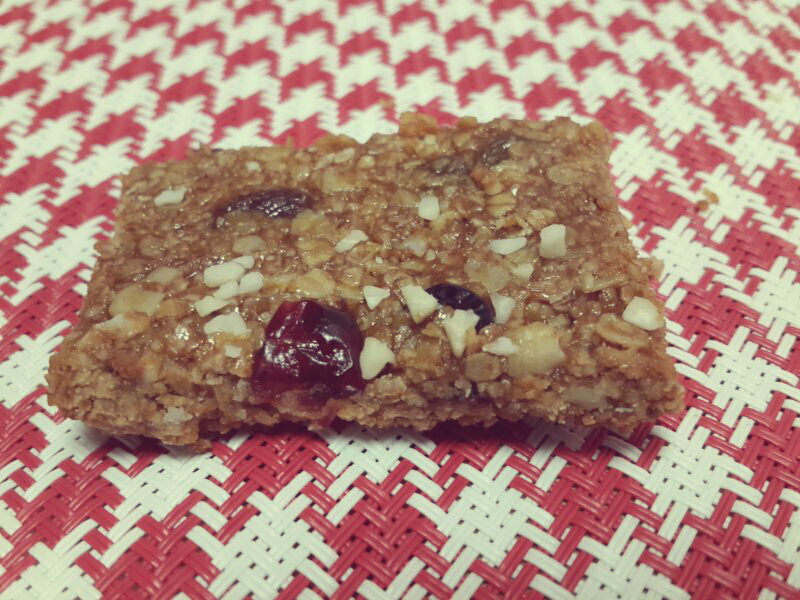 Toast the Oats slightly, it gives them a good crunch. You could toast them in the oven for 3-5 minutes or just dry roast in a wok. 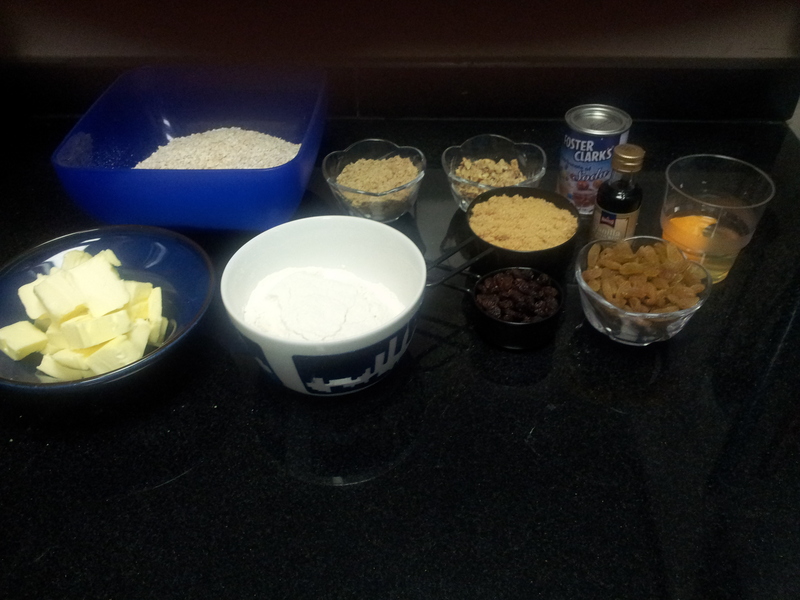 Mix oats, chopped nuts, raisins, almond meal and cranberries really well in a big mixing bowl. 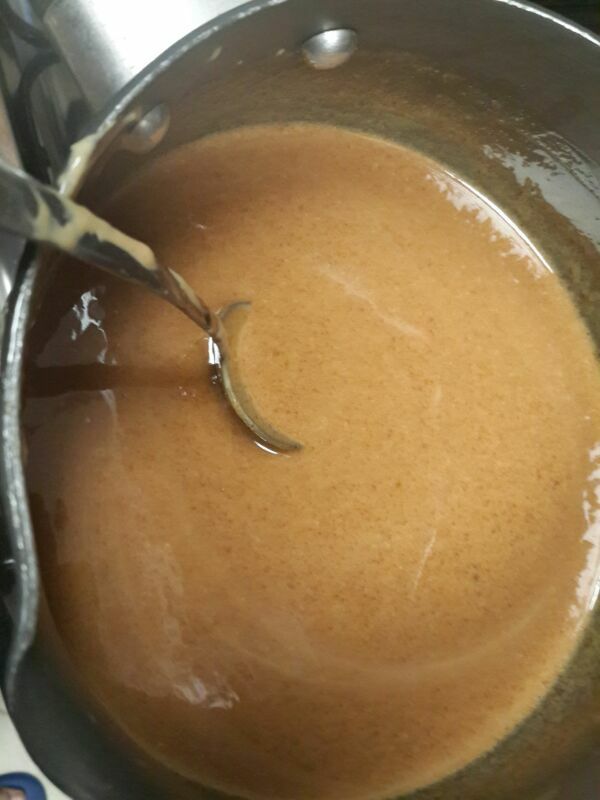 On low heat, add oil, sugar, peanut butter, honey and date syrup in a saucepan and keep stirring it so that it does not stick to the bottom of the same. Take off heat once all the ingredients have blended well, add vanilla essence and mix well. 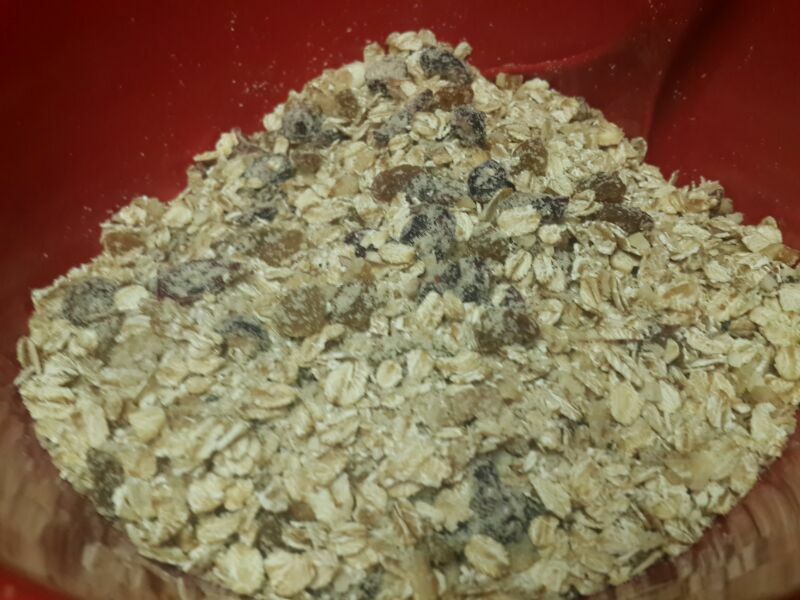 Pour the hot mixture over the oats mixture and with the help of a spatula mix them well. 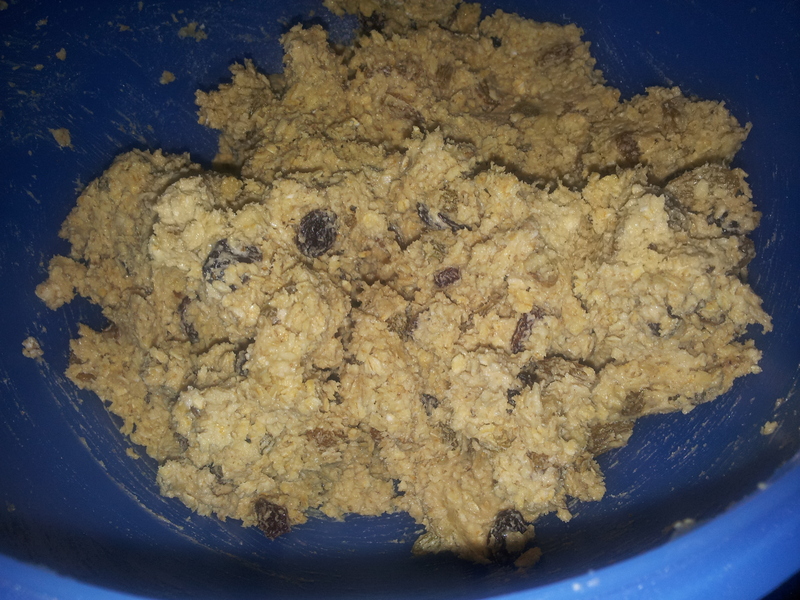 Scrap the mixture from sides of the bowl and let it rest for a few minutes. 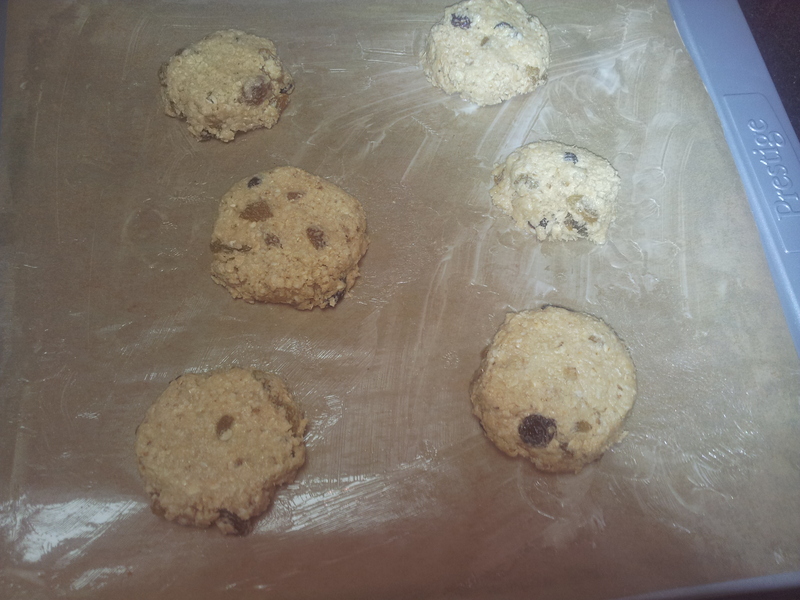 Grease a baking tray and layer the oats mixture on the same. Bake for 20 minutes and voila you are saying good bye to hungry mornings! 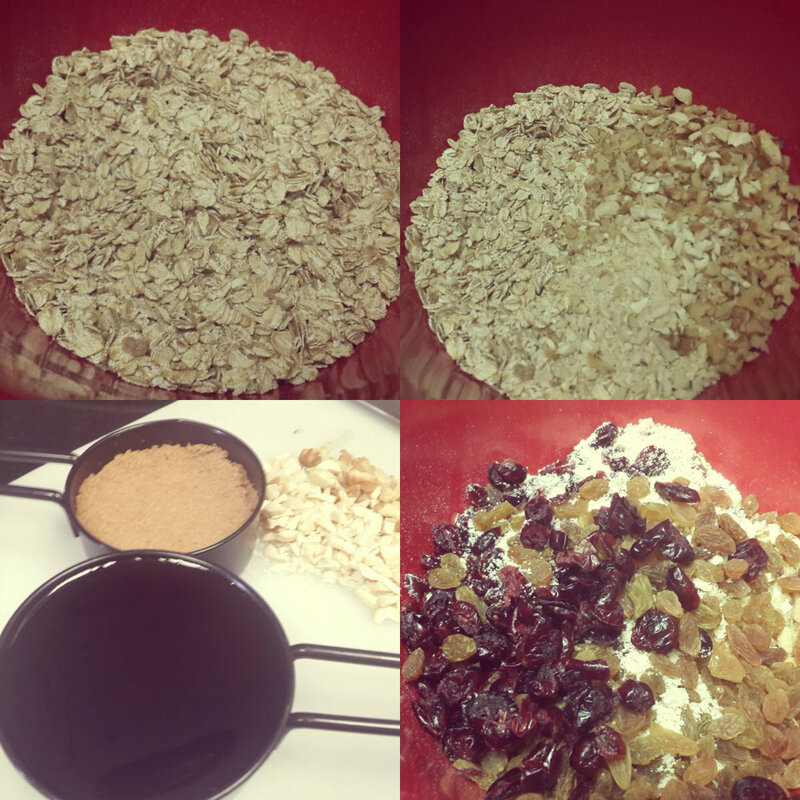 My first attempt at this was not that great and I wasn’t happy with the shape for the granola bars since I tried them in a 9 inch cake mould. I just couldn’t find my baking tray. 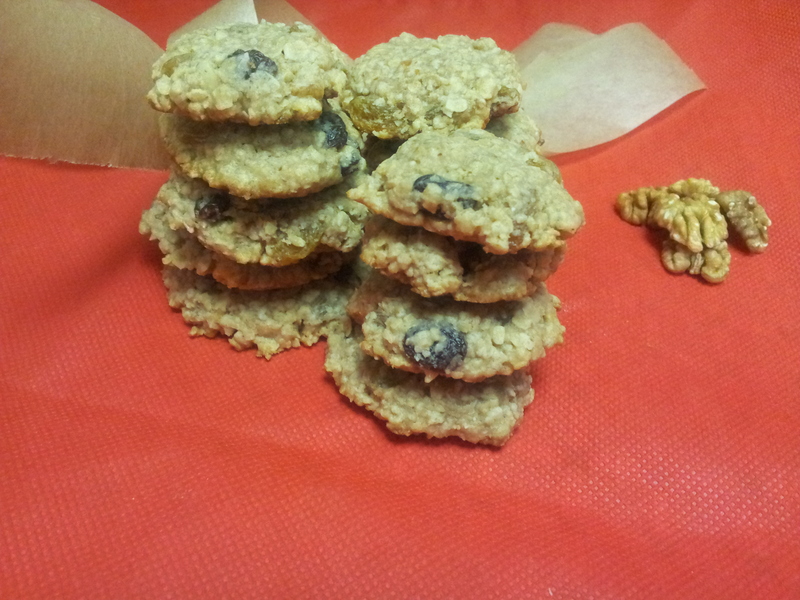 So there you see chunky bits of granola however this time around I spend some time on doing my prep right. I used a baking tray and dumped the mixture on the same. With help of greased spatula I spread the mixture and had a thin layer on to the tray. You can even grease your fingertips and flatten the mixture on the surface. 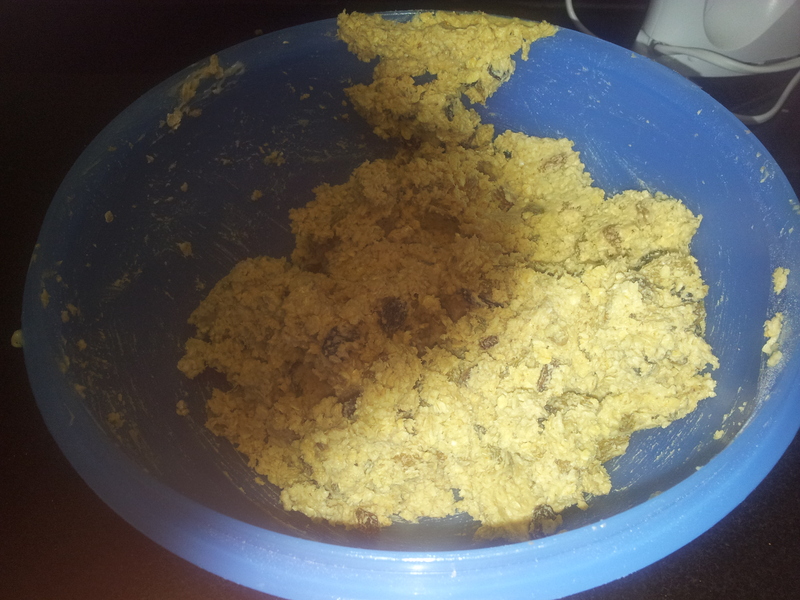 Let the mixture cool down for a while before you cut them in neat squares. Store in an airtight container, they will stay well for a 7-10 days.